Parade de quarte au dedans de l’Espee. Les Vrays principes de l’espée seule… par le Sr de La Touche. 1670. Note that the figure in the lunge is illustrated with a rolled ankle, a common practice at the time for gaining distance. Monsieur de La Touche was a 17th Century French Master. He played in integral role in the process of standardizing fencing terms and in establishing a codified method of fencing instruction. 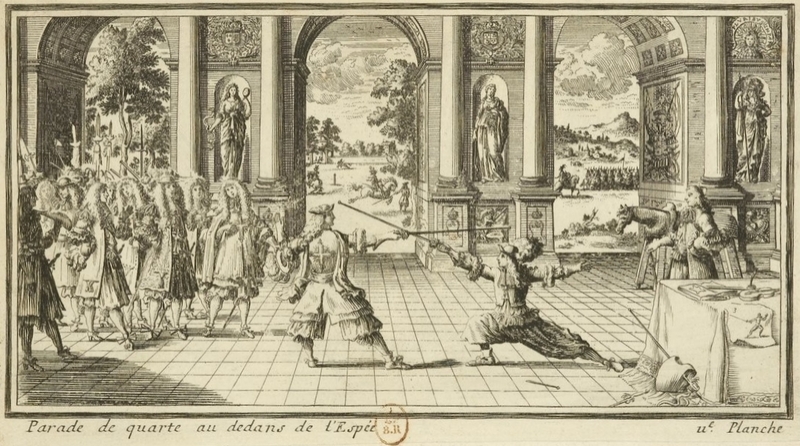 The plate above is from his 1670 Les Vrays principes de l’espée seule… par le Sr de La Touche [French]. Touche’s 1670 treatise is now available here on the SmallswordProject.com, as are a number of other historic texts in our Study section. Image | This entry was posted in Art, Historic Text and tagged 1670, 17th Century, de La Touche, Engraving, French, Historic Text, Les Vrays principes de l'espée seule, Lunge, Plate, Salle, Touche. Bookmark the permalink.